I signed up with six of the most popular shared hosting companies and set up a website on each one. I tracked server uptimes, monitored website load times, tested support quality by inducing a website malfunction, simulated sudden traffic spikes to assess server performance, calculated the short- and long-term costs of hosting with each company, and much more. If you’re not interested in my research and are just looking for the best hosting services, skip to so which is the best web hosting service provider? I focused on the shared hosting plans exclusively. I will provide separate overviews of their VPS and dedicated servers in the future. Let’s see which of the above deserves the “best web hosting” label. I started by registering an annual shared plan with each company. I then bought six .xyz domains- one per host- because they were inexpensive ($0.99/year). I then installed WordPress (WP) on each of the six websites. Since WordPress powers more than 32 percent of all websites, I conducted all hosting tests on a WP platform. The prices listed below are what was available to me. As far as I know, hosting companies can show slightly different prices to users in different regions. Additionally, some hosts will offer a discount if you contact them via live chat before making your purchase, so it’s always a good idea to ask. New members get the discounted first-term pricing, but when it’s time to renew, the renewal pricing applies. GoDaddy and SiteGround do not offer discounts on their 3-year terms. HostGator offers the biggest discount. 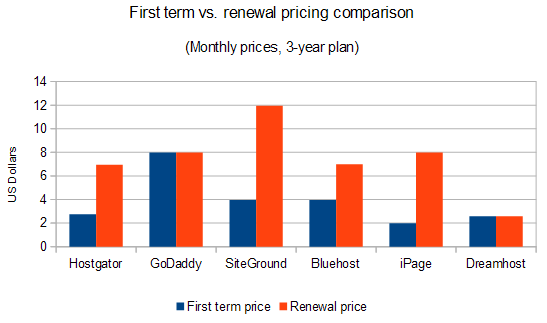 HostGator, SiteGround, and iPage have significantly higher renewal prices than introductory prices. GoDaddy and DreamHost prices are the same for first and subsequent terms. You opt for an initial 3-year plan to maximize the value of first-term discounts. You always renew for three years. GoDaddy has the most expensive initial three-year term (close to $300 total). 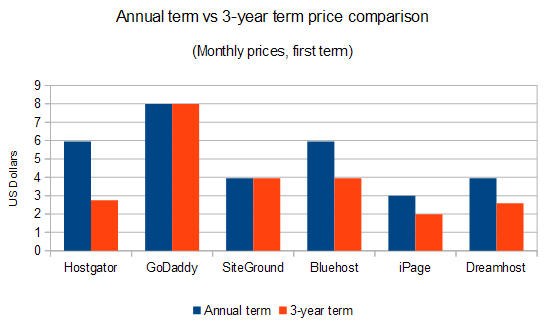 Around the 6-year mark, the total cost for hosting with GoDaddy and SiteGround equalize. After nine years, SiteGround overtakes GoDaddy as the most expensive shared hosting service ($1,000 in total expenses). At the 6-year mark, DreamHost becomes (and continues to be) significantly cheaper than the other providers. 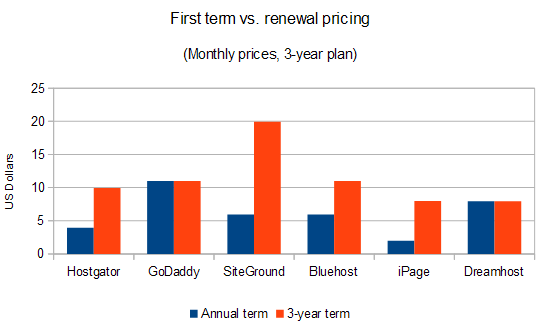 Bluehost, iPage, and HostGator expenses increase roughly in tandem. Just like with the single-website plans, GoDaddy and SiteGround offer the same monthly rates on annual and 3-year terms, while HostGator does its best to make 3-year terms enticing. 2.3 What about single-website pricing vs. multi-website pricing? iPage offers the cheapest multi-website hosting. DreamHost has the largest price hike from single-website to multi-website hosting. iPage offers the cheapest multi-website hosting over the long run. 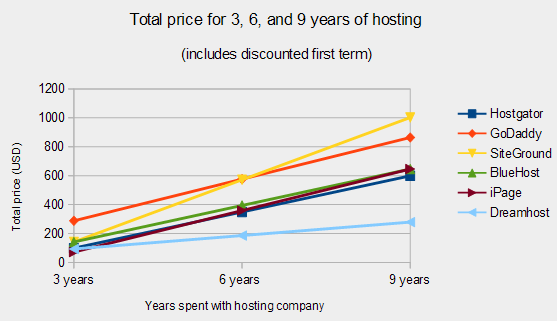 DreamHost, Bluehost, and HostGator carry similar long-term costs. By the six-year mark, SiteGround becomes the most expensive option. Verdict: Which web hosting service offers the best prices? Pricing is a tricky business. Your budget plays a significant role, as does the number of websites you plan to host. Unfortunately, iPage comes with some serious quality issues (read on to learn more). You probably don’t want to host with them unless you’re on a very tight budget or if you’re planning to host a small private website only family and friends will visit. Uptime (availability) expresses the amount of time a website on a server remains accessible online. The higher the uptime percentage, the better. The lower the uptime percentage, the more downtime your website experiences. When your site is down, visitors can’t access it. I began tracking the uptime of each of my six websites on January 9th, 2019, with the following results. Here’s a list of the single longest downtimes each server experienced. It’s worth noting that in all cases, whatever caused the downtime was resolved automatically by the respective hosts, without my need for intervention. Note that even apparently small differences in uptime percentage can have a major impact on the accessibility of your site. Take a look. Generally, uptimes below 99.95% should be a red flag. Verdict: Which web host has the best uptime? However, even the worst performer on my list (GoDaddy) still did quite well with only ~20 minutes of monthly downtime on average, which shouldn’t be a problem for the majority of webmasters running a personal blog or small online store. First, I contacted the tech support of each host and inquired about the physical location of the server hosting my website. I wanted to know where the host’s data center was located so that I could choose website load speed testing services that had servers as close to that location as possible. It’s the only way for the test to be reasonably objective. Next, I used Pingdom’s Advanced Checks and WebPageTest’s standard pings to set up website speed tests for my domains. I tested loading times more than once every 30 minutes over the course of two weeks. That’s over 670 loading speed tests per website. As a reminder, each website was a simple WordPress installation with Yoast SEO and a few other plugins enabled. 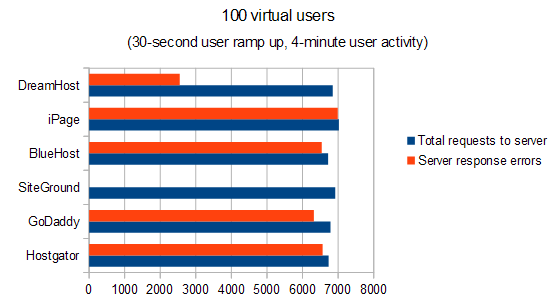 In my case, SiteGround had the best average load times at ~600 ms, and iPage was the worst performer with ~1 600 ms. The remaining hosting companies averaged between 800-940 ms. However, averages don’t tell the full story. I also wanted to understand how these load times fluctuated over time. 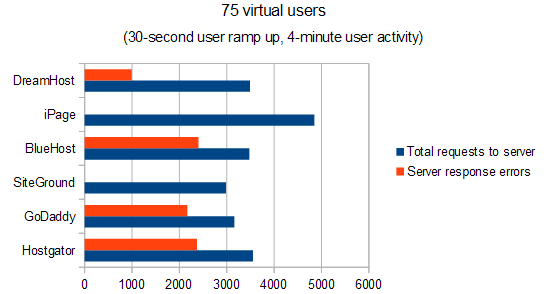 To account for this, I asked the following question: How often did load times spike to more than two seconds? I chose two seconds as the threshold because that’s the point beyond which bounce rates (the percentage of people who abandon your website) begin to increase, according to a Pingdom report. iPage disappoints again with 24 recorded spikes! Keep in mind this is for a simple WordPress page. 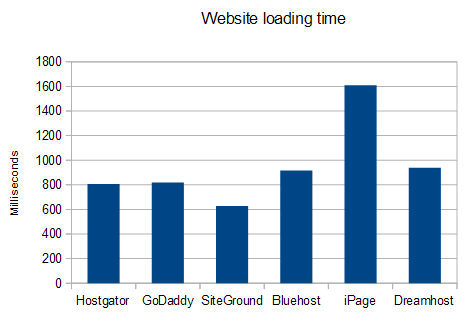 GoDaddy is on shaky ground with 11 spikes, and Bluehost leads the way with zero. Bluehost offers the most stability: a respectable 830 ms load time and not a single recorded spike over two seconds in a 2-week period. In fact, I did not register a single spike beyond 1.2 seconds. I would avoid iPage. Their average loading times are high– 1.6 seconds, and this value spikes to performance-impacting levels too frequently. If you expect your website pages to be large (3+ MB each), consider SiteGround for their lowest average loading times. My goal was to measure the quality of service (QoS) performance of each server based on the user behavior one might expect when a link to their website gets passed around social media platforms. HTTP request errors. An HTTP request is any request for information (a file, page, etc.) sent by a user to the server. I/O timeouts, which are often caused by a server’s traffic load balancer dropping connections. HTTP errors and I/O timeouts suggest the server experienced difficulties handling the sudden onslaught of traffic. A real user would experience this as a webpage failing to load or loading incorrectly or incompletely. The request column tells me which page was being accessed by the virtual user, the status column lists the type of HTTP response, and the count column tells me how many times this error occurred during the test. In the example above, we can see a 503 (“service unavailable”) error while accessing http://htd6.xyz occurred 304 times. In simpler terms, this means that 304 attempts at loading the front page of the website resulted in an error. Wow! There were zero HTTP response errors coming from SiteGround. They handled the sudden 100-traffic spike perfectly, and the average server response time was 92 milliseconds per request. DreamHost performed surprisingly well, too. Overall a lot of errors, but that’s expected; one hundred simultaneous users is a lot for most shared hosting infrastructures. 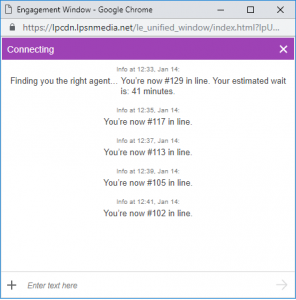 After the test, I manually visited each website to see if it regained baseline performance after the load test, and they all did– except for iPage. Instead of my WordPress site, I saw a database connection error. As you can see, making ~7,000 HTTP requests resulted, in this case, in exceeding a query limit and my website was taken down. SiteGround reports zero HTTP errors again, and the other hosts see definitive improvement. iPage, on the other hand… reports zero HTTP errors? I wasn’t expecting this. I reran the test (@75 VUs) and got the same result– zero errors. I ran it again a few hours later, same thing. Apparently, iPage’s server handles traffic spikes very well. The issue I experienced while running the 100 VU test was due to exceeding a certain threshold of database connections in a short time window. SiteGround and iPage return zero errors again, and DreamHost is down to a 4.5 percent error rate. I’m surprised by how well the two cheapest hosts are performing. The remaining three hosts still suffer from 30 to 50 percent error rates. By now, DreamHost is error-free, while GoDaddy is still having problems– a quarter of all user requests are either timing out or returning a 503 error. Due to the small number of virtual users, I was expecting all servers to return zero errors. However, GoDaddy still experienced a 4 percent HTTP error rate (confirmed via two subsequent tests). 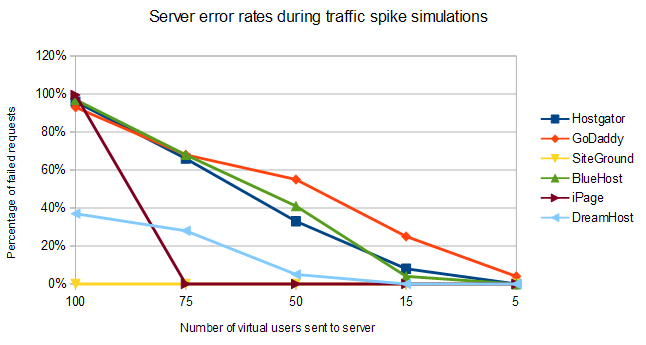 Verdict: Which hosting provider handles sudden traffic spikes the best? First, I want to mention that I repeated the tests above multiple times over a few days to make sure my results weren’t a fluke. In each case, the difference between results was negligible (less than 5 percent). SiteGround offers the most robustness. If you anticipate frequent traffic spikes (e.g., if you plan on marketing your website via social media) and their renewal pricing is acceptable, choose them. DreamHost and iPage handle traffic spikes surprisingly well given the low price. If you go with a shared hosting plan with HostGator, GoDaddy, or Bluehost, a significant number of your visitors may experience some difficulties navigating your website when more than 10 to 15 users visit and browse simultaneously. Still, if you’re expecting even modest traffic spikes fairly soon, you may want to think twice before hosting with GoDaddy. My approach was simple: I edited the WordPress wp-config.php file and changed the MySQL Database login credentials to incorrect ones. How long will it take them to figure out the problem? Will they fix it for me or give me instructions to do it myself? Technically speaking, the hosting company is only responsible for errors on the server side. Since my manufactured malfunction was on the website’s end, tech support is not obligated to solve the problem. I attempt connecting to live chat. Connection to live chat established. I’m asked to verify my identity. I haven’t heard back in a while. I inquire and am asked to wait a bit more. Support representative: “You may check the site now 🙂” The website was working. This took 45 minutes from start to finish. The representative spent 30 minutes looking for a problem with the database itself before finally checking the database login credentials in my WordPress settings. Good job overall, but it took the operator a little too long to get started on the problem. Connection established after seven minutes. The operator requests my account security PIN and begins the investigation. I’m again informed the MySQL database is working properly and that I need to troubleshoot the problem on my own because it’s not technically an issue with their service (which is true). I ask if a different support representative could take a look at the problem. I manage to connect to a different tech support representative. I verify my identity and wait. I’m finally told this WordPress support thread has a solution to my problem. The support agent also tells me I can have a GoDaddy expert handle the problem for $80 + tax. After 80 minutes, what I got was a WordPress support link, which I imagine many beginners would find intimidating to go through. To be clear, GoDaddy was completely within their rights to refuse further help. They are under no obligation to help me fix issues with my website, and their tech support only covers server-specific malfunctions. Still, considering how the remaining hosting companies were willing to modify my wp-config file (see below), I was somewhat disappointed with GoDaddy. Connection established. Support representative begins to investigate immediately. I’m told “there doesn’t appear to be a problem with the database.” The technician even disabled all my WordPress plugins to make sure none of them was the culprit. The technician gives up and suggests I should pay $30 to restore my website from their automated daily backup. I refuse and ask for my support requested to be escalated. The representative tells me they have opened a support ticket in my name and assigned it to a senior support team member. I’m told to expect a reply in 15 minutes. I receive a reply: “I am glad to inform you that I have found and fixed the error.” The site works. That’s 34 minutes total. Quite fast, but I was disappointed by how quickly the first operator threw in the towel. If I was less experienced or if I didn’t know the problem was easily solvable, I might have been down 30 bucks. Moral: If you don’t receive a satisfactory solution, ask to have your support request escalated or try connecting with a different operator. This is true for all hosts, not just SiteGround. Connection established. I’m asked to validate my account. The representative confirms they have begun investigating. I ask how things are going. The operator asks me to wait an extra four to five minutes. I hear back: “The database name was incorrect in the wp-config file and it was updated.” The site works. In total, it was 21 minutes from the moment I connected to live chat and 16 minutes from when the operator started looking into the issue. I hear back: “The database username was incorrect, I have corrected it, please check now.” The site works. Wow, that was fast! Just a few minutes and my website was working. It seems the operator’s first instinct was to check if the database login credentials were correct, as opposed to looking for a problem with the database itself. Operator: “the username on the wp-config file was incorrect, I fixed that for you” The site works! 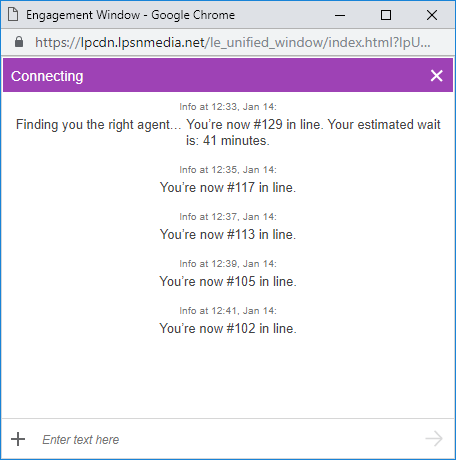 That’s two minutes total from clicking “connect to live chat” to problem resolution. Impressive. DreamHost and iPage did surprisingly well. They did not waste time attempting to verify my identity or getting my e-mail address and instead dove into the problem headfirst. They also assumed the most likely problem was human error (incorrect database connection credentials in my WordPress configuration file) as opposed to a system failure. As a result, they solved the problem in a few minutes. GoDaddy’s unwillingness to bend the rules a little and help out when they easily could have was disappointing. Finally, I’ll be the first to admit this test isn’t perfect; obviously, the quality of support you receive will depend on the problem and the support agent handling it. However, there is still valuable insight to be gained from this test. How much time do I have to request a refund after buying a hosting plan? If I get a refund, am I still eligible for a refund on any future hosting purchases? How long will I have to wait before I receive my refund? Can I request a refund through the website, or do I need to contact support? Here’s what my research uncovered. Days to request refund How to request a refund? Using the refund-request method listed in the table above, I asked for a refund 12 days after purchasing my hosting accounts. I’m happy to report I received my money back from every company. All I had to do was cancel my account and the refunds were issued automatically– except HostGator, whom I had to contact via email after canceling my account to receive a refund. 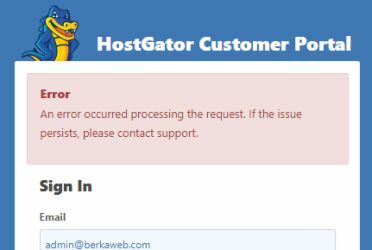 You must contact HostGator support after canceling to request a refund. As you can see, I received my money back very quickly in all cases. None of the hosting companies made canceling my account and requesting a refund problematic. It felt like a routine and straightforward operation. What storage capacity did each hosting service offer? What are the bandwidth (data transfer) limits? Are there any restrictions on the size and number of MySQL databases I can have? What’s the maximum number of files I can have on my server? There isn’t such a thing as true unlimited storage. However, the warning above applies mostly to malicious actors. If you’re planning on using your hosting account as intended (e.g., to host blogs, e-commerce stores, or a business website), you’re very unlikely to run into issues. Okay, but how much storage does your website need? This depends on the type of website. For example, a site with tons of high-resolution photos and HD videos will require significantly more storage space than a blog or an online store. The WordPress installation files take up roughly 40 MB. Assume an additional 100 MB for plugin files and themes. According to MatchMetrics, the average webpage size in 2018 is larger than 2 MB. This means that, on average, having 1,000 pages on your site will occupy 2,000 MB (2 GB) of space. In total, a hypothetical 1,000-page WordPress site will occupy 40 + 100 + 2,000 = 2,140 MB, or 2.14 GB. Keep in mind any website backups will use up storage space as well. Again, this is a very rough approximation and only intended to give you a ballpark figure. Hopefully, it helps you see the majority of new website owners won’t come close to their storage limits. Bandwidth refers to how much data can be transferred back and forth between your website and its visitors. The more visitors and the larger your website, the more bandwidth you’ll need. 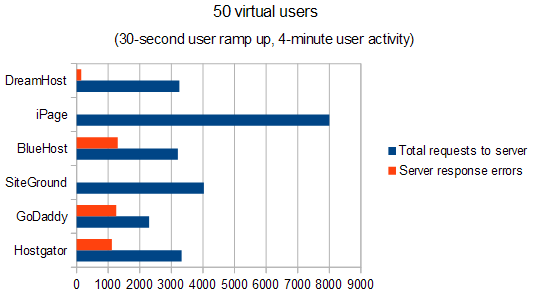 So how much bandwidth do the best hosting services provide? Hosting providers love the term unmetered bandwidth. However, this is more of a marketing ploy than anything else. All hosts reserve the right to throttle bandwidth if they, at their sole discretion, determine your traffic volumes and data transfers have exceeded their “fair use” policy. Unfortunately, nowhere on their websites does it specifically say what constitutes fair use. I contacted each host’s support team and asked them for the average number of daily visitors a typical WordPress blog can receive on their hosting before bandwidth is throttled. Whether or not serving as many visitors as listed above will lead to performance degradation is an entirely different story. Still, it’s helpful to see what company representatives consider as upper traffic limits. Again, keep in mind there’s no such thing as unlimited space. Some of these limits feel a little restrictive. As a point of reference, I have a WordPress site with around 250 posts, and the database for that site is around 100 MB large. Moreover, if you plan on hosting your own website analytics (such as Matomo) instead of using an external service like Google Analytics, be aware visitor logs can end up taking up huge amounts of MySQL storage space if you let them pile up. You’ll want to set up periodic purging of these logs. Overall, database size limits are more likely to become a bottleneck for the average user than the total storage capacity of their hosting account. If your website uses a database and you expect the site to have in excess of a thousand large pages, you’ll want to keep an eye on the size of your database. You’ll also want to avoid SiteGround’s basic shared plan due to its 500 MB limit. An inode is a data structure that describes a file system object. Don’t let that scare you: an inode limit simply tells you how many files and folders you can have on your server. Being able to host 200,000 to 250,000 files/folders may sound like a lot– and it is. For example, a well-maintained WordPress blog is unlikely to use up more than 50,000 inodes, even if it has hundreds of posts and multiple images per post. Generally speaking, the above inode limits are generous and enough for two or three active websites. The limits might become a problem if you plan to host four or more websites, or if you allow unused files (deactivated plugins and themes, cached files, multiple copies of the same image) to pile up and use up inode quota. Verdict: Which host offers the most resources? All things considered, the differences are not considerable enough to make resource availability critical selection criteria– at least not for beginners. There is one important exception: If you expect more than 10,000 unique visitors per month, stay away from SiteGround. They openly list this as the upper limit for their StartUp plan. SiteGround has the most restrictive resource allocation policies. However, this comes with an upside: They offer exceptional website performance. What happens if you accidentally delete important website files? Does the host offer free malware scanning? And just how difficult is it for malicious attackers to hack into your admin account? While automatic backups are usually offered for free, most hosting companies will charge you to restore your website from a backup. How often are backups taken, how much will it cost you to restore your website, and what premium options are available? If you’re planning to host a WordPress site, you can install and configure a WordPress plugin that will take automatic backups of your site. In this case, whether your hosting company offers additional free automated backups becomes less relevant. However, it’s safer to be with a hosting company that offers free backups. It adds an extra layer of security and improves your odds of a successful website recovery in case of a digital disaster. Does the hosting company offer free backups? How much does it cost to restore your website from a backup? What premium backup services are available? After some digging and over two hours on live chat, here’s what I learned. Bluehost is the clear winner, with free daily backups and free restorations on all plans. GoDaddy and iPage take daily backups but charge preposterous fees ($180) for a restoration. They clearly want to force clients to buy their premium backup service. The disadvantage is clear: They cost money. As you can see, some premium services come with additional file change monitoring, which keeps tabs on your website and sends you an e-mail notification if there is an unauthorized change to any of the files on your server. Note that if a backup would take you over the allotted storage capacity, the backup will not execute. You’ll need to upgrade to a backup plan with more storage or find a different solution. Choose Bluehost. Nothing beats free daily backups and free restorations on all plans. As far as premium services, most users will not need one unless they require more control over their backup schedule; in which case, iPage offers the best price and uncapped storage capacity. HostGator users without a Managed WordPress plan should consider going premium, if only for the advantage of having access to free backup restorations. Why? Because the regular restoration cost at HostGator is $180 with taxes, equivalent to more than seven years of a premium backup subscription with free restorations. According to a SiteLock report, the average website is attacked over 44 times each day, and over 1 percent of all websites online are infected by malware each week. What can you do to be on the safe(r) side? Here, again, you’d have the advantage using WordPress, as you can install one of multiple malware detection plugins, such as VaultPress. However, if you are not using WordPress, or if you are looking for an extra layer of protection, read on. I was surprised to learn not every host performed routine malware scans for free. Some only do free scans on request, while others only offer them as a paid service. Free malware scanning? Scanning frequency Malware removal if detected? Your website is instantly taken down and you are contacted and asked to remove the malware. In most cases, your website will not be brought back online unless you use a certified malware removal service and present a cleanup certificate. This can cost $50 – $100. The only way to avoid these problems- other than installing a WordPress malware detection plugin- is to buy a premium anti-malware package. Do they offer premium malware detection? What happens when malware is found? What struck me was that not all malware detection plans come with automated infection removal; some plans only offer detection. The user is notified by email when malware is detected and it is up to them to fix the issue. I assume the majority of users wouldn’t be interested in such a plan and would rather pay extra for automated malware clean-up. As a result, my comparison only includes the cheapest malware detection plans that offer automatic removal. If the cheapest plan overall did not include removal, I skipped it until I found a plan that did. 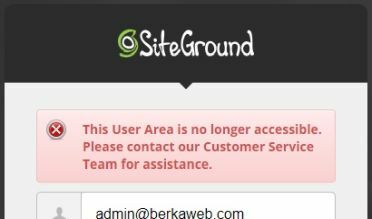 SiteGround Sucuri SG Scanner $20 Does not include malware removal; none of SiteGround's plans do. DreamHost Proprietary software DreamShield $36 Does not include malware removal; none of DreamHost's plans do. The prices above are for annual plans. Most of the best web hosting providers offer small discounts (5 to 10 percent) if you buy their 2- or 3-year subscription. HostGator is the only company offering free daily malware scans (no free removal). The other hosts either don’t or require you to personally request one by contacting support. If automated malware removal is a priority, avoid SiteGround and DreamHost. Neither their free nor premium malware plans offer it. The remaining hosting companies all sell quality malware detection/removal software and offer them at similar pricing. As a result, I can’t make a definitive recommendation. GoDaddy is a few dollars cheaper than the other options. Malware infections are not the only type of attack that can ruin a webmaster’s day. Malicious third-parties may attempt to hack into your hosting control panel directly, giving them full authority over your website. By now, everyone (hopefully) knows they should use strong, non-obvious passwords, and to keep those passwords safe and private. However, in rare and unfortunate situations, this isn’t enough. Do hosts offer two-step verification when logging into your server control panel? Do they lock your account after too many failed login attempts with an incorrect password? The first one was easy enough. I just asked support. Results. You can enable two-step verification in the “security settings” section of your hosting control panel. After you’ve enabled it, you’ll need your password, and a one-time security code that you’ll receive via SMS or through the Google Authenticator app. This makes it impossible for unauthorized third-parties to log into your account, even if they manage to guess or otherwise obtain your password. To log on, they’ll need your cellphone. Next, I attempted to log into my hosting accounts using the wrong password to see how long it would take for them to time me out. Timeout duration: Appears indefinite; my IP address was automatically banned and I was no longer able to load the sign-in page in my browser. I had to contact customer support and ask them to whitelist my IP. Timeout duration: Five seconds after five failed attempts. After that, each additional unsuccessful login attempt resulted in a 16-second timeout. 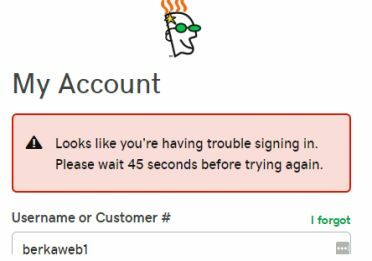 After a total of around 20 unsuccessful attempts, I had to wait 50 seconds between additional incorrect login attempts. After over 100 login attempts using an incorrect password, I was still able to instantly log in using the correct passphrase. I gave it another shot the next day. This time, my account was locked after around 20 incorrect attempts, and I had to contact support to solve the issue. Why wasn’t I locked out the first time? No clue. I have contacted their support and they are looking into it; I’ll keep pressing the issue until I find a satisfactory answer. Timeout duration: Five minutes. After the time was up, I was granted an additional five incorrect password attempts before being timed out for another five minutes. Seems like a reasonable solution. But then when I tried my correct password, I could not log in. It was still telling me my password was incorrect. I contacted iPage support about this, and they told me that my IP was blocked. Apparently, their system blocks your IP after five unsuccessful login attempts, but it does not inform you of this. The only way to remove yourself from the blacklist is to contact support. You will need to answer your security question. Although I’m sure this is successful at deterring hackers’ password brute force attempts, it would have been nice to see a message informing me to contact support to fix the issue. Not an ideal user experience. 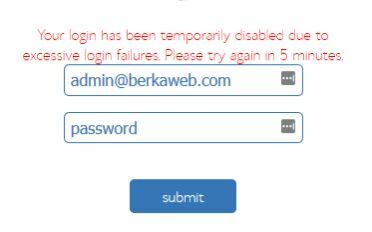 Timeout duration: My IP was blacklisted, and I saw an error message (shown to the right) when attempting to access the login page. I had to contact DreamHost support to resolve this. Both iPage and SiteGround are lacking. If you have an account with any of these two hosts, be extra careful and use a strong password. 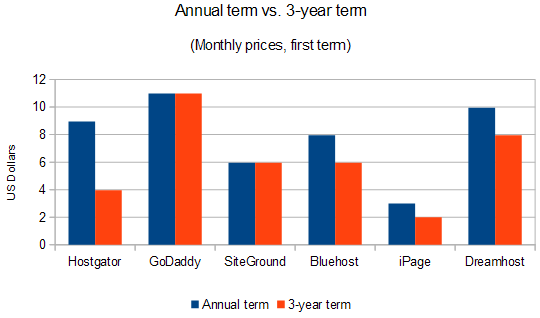 Between the remaining four, Bluehost and GoDaddy performed the best. Both have two-factor login authentication and a login timeout mechanism that does a good job of preventing brute force attacks without confusing the legitimate account owner (like iPage did) in the process. I tested the queue times for each host three times during early morning hours, and three times during rush hours (between 7 and 9 p.m.). During rush hour, the support representative would take more than three minutes between replies, presumably because they were busy serving other clients. I did not experience this issue during morning hours. Support quality is good. Representatives are knowledgeable and proficient in English. Very long queue times most of the day. If you face an emergency situation, you’re better off calling their phone support than waiting for a live chat connection. Support quality is good and most representatives seem to be native English speakers. Some representatives prefer to provide links to articles in their Frequently Asked Questions (FAQ) database rather than provide a direct answer. This can be frustrating when you’re asking simple questions that would take no more than a few seconds to answer. Unfortunately, live chat is not available on weekends, leaving only their toll-free number (866 964 2867) as a means of obtaining support. No e-mail support is available. This was a major inconvenience. SiteGround’s support representatives are the friendliest. They are knowledgeable, exceptionally courteous, and go out of their way to help– even if they don’t readily have an answer to your question. For example, when I asked about the maximum number of failed log-in attempts their system will allow before timing out my account, the support operator manually tested it out by attempting to log into my account multiple times using an incorrect password (after requesting my permission). The quality of support is a bit hit-and-miss. Some representatives weren’t native speakers, leading to minor confusions and forcing me to rephrase some of my questions. Decent, but may require a little more patience than other live chats. Also, they try to upsell their customers a little too often. Each time I asked a question about their SiteLock subscription, I was asked to provide my phone number so they could give me a call to talk it through. When I asked website-specific questions, they would offer me their paid WebsiteBuilder service. Connection times are very fast. Support representatives are fluent in English and understand the services offered by DreamHost very well. Their live chat was twice offline at a time when, according to DreamHost’s own timetable, they should have been operational. I was told these were both technical glitches. 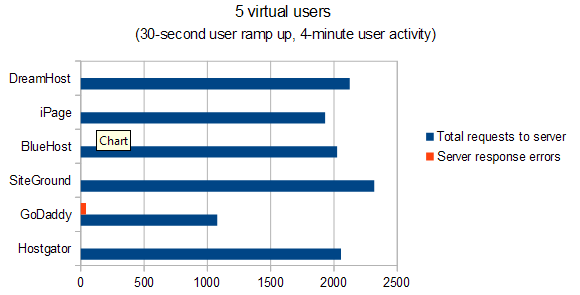 Verdict: which web host has the best live chat customer support? I was most impressed with the chat support I received at SiteGround, with HostGator and Bluehost both tied at a close second place. GoDaddy does a good job as well, but their long queue times and unavailability on weekends are major cons. Although freebies aren’t the most imoprtant factors to consider when choosing a host, they are nice to have. Read on to learn about free domains, SSL certificates, and the price of having your website moved to your new server by an expert. Which hosting companies offer a free domain when you open a shared hosting account? How much does it cost to renew after your initial free term is over? Not all hosting providers offer a free domain, as you can see below. The best deal is available at DreamHost, where you get a free domain for one year, followed by the cheapest renewals at $14/year. Notice that when a free domain is available, it’s only for one year. After that, you’ll need to pay a renewal fee between $14 and $18 per year, depending on the company. It makes more sense to purchase your domain at Namecheap.com, where a domain costs between $9 and $11 – and point that domain at your hosting server. Alternatively, you can take advantage of the free domain at your registrar of choice and move the domain to Namecheap (or to another inexpensive registrar) before it expires. This way, you get a free domain and avoid paying your hosting company’s somewhat high renewal fee. An SSL certificate encrypts and secures the connection between users and your website. It’s a must-have for any website handling sensitive information (e.g., credit cards, users’ personal data), and probably a good idea for any website owner. Since 2014, SSL has also become a ranking factor in Google’s algorithm, another reason you should consider having one. Which hosting companies offer free SSL on their basic plans? How long is the free certificate for? What’s the price of an SSL certificate after the free one expires? HostGator and Bluehost win the day by offering free SSL certificates that are enabled by default as soon as you activate your hosting account. GoDaddy, unfortunately, does not offer a free certificate with their basic shared hosting plans at all. Some hosting companies offer free website migration. They’ll move your website from wherever it was hosted earlier to your new hosting account. Use cPanel’s Backup Wizard tool to create and download a copy of your entire website, then use the Backup Wizard restore tool at your new host to upload the website. This only works if your old and new servers both offer cPanel. If you’re running a WordPress site, use one of multiple plugins to safely move your site. However, if you prefer experts to handle the migration for you, here’s what you can expect. Migration officially takes one to seven days but should usually be completed in less than 48 hours. HostGator takes the definitive lead, as they are willing to migrate any website (not just a WordPress site) for free. Good news, though: The sites that do not offer a free migration service are willing to help you manually complete the process through live chat. SiteGround offers the best server robustness. If quick load times, excellent server uptime, good live chat support, and phenomenal performance under sudden traffic bursts are important to you, you can’t go wrong with them. The quality comes at the cost of lower resource availability, so if you anticipate in excess of 200-400 visitors per day, you should reconsider. SiteGround is also the most expensive of the tested providers in the long term (over 6 years of service). 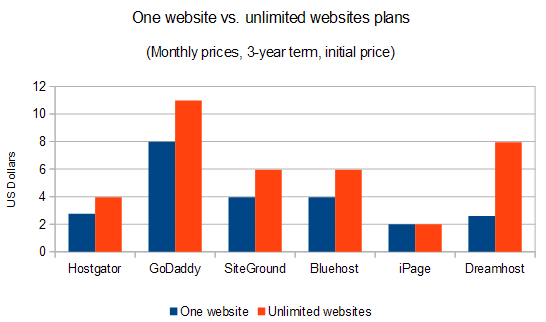 Bluehost and HostGator are tied on performance and pricing. They both offer free malware scanning and automated website backups. Both offer a very respectable service and you can’t go wrong with either. Bluehost does have slightly better uptimes and 2-Factor authentication on account login, which probably makes them the favorite of the two. DreamHost was the dark horse in this race. Their servers handled traffic spikes very well, and their uptimes are right up there with the best. They don’t offer free website backups, but they do offer free malware scanning. They are also surprisingly cheap in the long run, coming in at around $230 total for 9 years of single-website hosting – that’s less than 50% of what the second-cheapest quality provider, Bluehost, costs. If you’re looking for quality at the most affordable pricing and don’t mind slightly elevated, but still acceptable, load times, go with DreamHost. I wouldn’t recommend GoDaddy. They are almost as expensive as SiteGround without offering the same quality. Their servers handle traffic spikes very poorly, dropping connections even at low (5-10) volumes of concurrent visitors. They charge an arm and a leg for restoring websites from their free backups and do not offer free SSL certificates on basic plans. Their live chat is not available on weekends, and during the 13 hours that they are available on each business day, their queue times are frequently longer than 10 minutes and often higher than 30. I see no reason to choose GoDaddy over any of the above alternatives. Finally, unless you are under an extremely tight budget, avoid iPage at all costs. Their shared servers suffer frequent downtimes, and their website load times are among the worst I’ve ever seen.